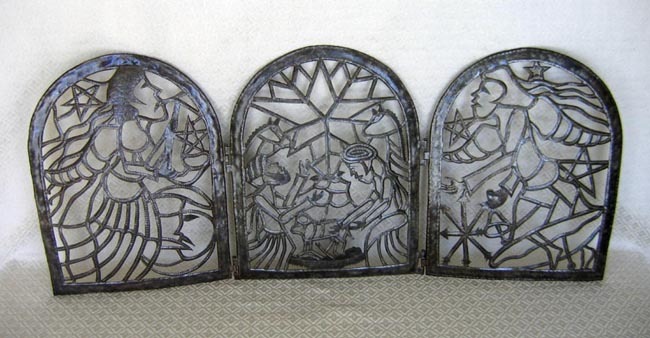 This Nativity is a triptych of three hinged panels, each with cutout designs. The center section depicts the Holy Family with a sheep, two horses, and a large star overhead. The two side sections depict angels with wings, a quarter moon, and several stars. The triptych measures 36 inches long by 15.5 inches high. The piece is signed “Jose de Pie” by the artist; he chiseled his name on the bottom of the center section. Resourceful artisans in the village of Croix-des-Bouquets in Haiti use recycled 55-gallon oil drums to make their traditional art. They cut out the top and bottom, and flatten the sides using their hands and feet. They clean the drums and any remaining oil residue is burned off. After flattening the drum, the artisan sketches a design on the metal and cuts intricate designs with only a hammer and chisel, using nearly the entire oil drum. After the edges are sanded smooth, the artisan applies varnish to keep the metal from rusting and dries it in the sun. Because Haiti is one of the poorest countries in the world (the poorest in the Western Hemisphere), continuing orders for handicrafts are very important for artisans to provide basic needs for their families. Comite Artisanal Haitien is a non-profit marketing cooperative representing more than 160 individual Haitian artisans and groups. CAH artisans, from Cite Soleil and other poor slum areas in and around Port-au-Prince, weave baskets using a variety of low-cost raw materials and create works of art from recycled metal oil drums.